Elvis in July—In the 1950s Memphis was hot in July, and so was Elvis Presley. Perhaps the most important event of his career happened in July 1954. It was that very first recording session, when Elvis, Scotty, and Bill spontaneously changed the course of pop music when they recorded “That’s All Right” at Sam Phillips’ Memphis studio. 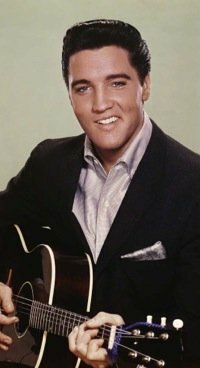 Three of the four movies Elvis made in the 1950s—Loving You, Jailhouse Rock, and King Creole—were released nationally during the month of July. And arguably the most important event in Elvis’s career during the 1960s, his triumphant return to the Las Vegas stage, happened in July as well. 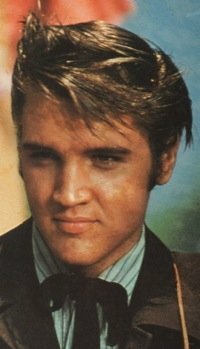 The mid-summer month was a momentous one in the life of Elvis Presley. 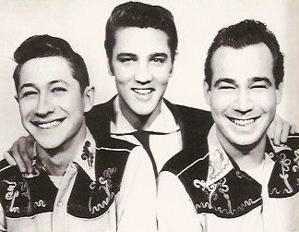 July 4, 1954 — Elvis, Scotty Moore, and Bill Black got together for the first time at Scotty’s apartment in Memphis. July 5, 1954 —Elvis, Scotty, and Bill recorded “That’s All Right, Mama” at Sam Phillips’ Memphis recording studio. July 30, 1954 — Elvis appeared on stage at the Overton Park Shell in Memphis. It was during this show that Elvis first became aware of the crowd reaction to his nervous leg movements. July 1, 1956 — Elvis appeared on The Steve Allen Show broadcast nationally from New York City. Elvis wore a tuxedo and sang to a hound dog. July 2, 1956 — Elvis recorded “Don’t Be Cruel” and “Hound Dog” at RCA’s New York City studios. July 3, 1957 —Judy Tyler, Elvis’s co-star in Jailhouse Rock, died with her husband in a car accident in Wyoming. July 9, 1957 — Elvis’s second movie, Loving You, premiered at Memphis’s Strand Theatre. July 2, 1958 — Paramount released Elvis’s fourth movie, King Creole, to theaters nationwide. July 7, 1965 — Tickle Me, Elvis’s 18th film, opened across the country. July 6, 1966 —Elvis’s 21st movie, Paradise, Hawaiian Style, was released nationwide by Paramount. July 31, 1969 — Elvis performed on stage at the International Hotel in Las Vegas. It was his first live appearance since his 1961 concert in Honolulu. July 13, 1976 —Vernon Presley fired Elvis bodyguards Red West, Sonny West, and Dave Hibler. The next year the three would author the tell-all book Elvis: What Happened? During his breakout year of 1956, it was to be expected that whenever Elvis appeared in a community he would be the target of criticism leveled by civic groups and government agencies who felt his act was a negative influence on teenagers. However, adult anxiety over Elvis caused him to be blamed for some teenager misdeeds, even in cities where he had never appeared. One example was Ottawa, Canada, where police raided a beer party in July 1956. According to a July 18, 1956, article in Variety, “When police walked in, Presley pictures were on the walls, Presley disks were on the record players, ‘I Love Elvis’ badges were on blouses and skirts. ‘It’s a pain in the neck,’ said a policeman.’” The president of the Ottawa Elvis Presley Fan Club, 18-year-old Bernard Raymond, who was among those detained, later pleaded guilty to participating in drinking at the party. Raymond was ousted from the club for his actions, and the Elvis club decided to do the same to any of their members (over 1,200 at the time) who disgrace the club in any way in the future. “We have no intentions of being connected with these so-called rock ’n’ roll violence worshippers,” said club secretary Peter Mercer. Meanwhile, that same month Aylmer, another town in Quebec, took steps to “strike Elvis Presley off the books.” Honorius Belesque, 18, mayor-elect of Aylmer’s “Teen Town,” called for a ban on Elvis’s teenage followers. (Variety’s report on the ban included no details on how the “ban” would be enforced.) Belesque said she favored a more “liberal” trend in music but called Elvis’s songs “suggestive.” Her call for a ban on Elvis’s music failed to draw support from local jukebox operators, who refused to remove Presley disks from their machines. British Journalist Witnessed Musical Finale for Girls! Girls! Girls! The final musical production number for Elvis’s eleventh movie, Girls! Girls! Girls!, was filmed at Paramount’s Hollywood studios in May 1962. British journalist Jonah Ruddy was afforded the rare honor of being on the set that day, and he reported on what he saw in the July 13, 1962, issue of the popular British magazine, New Musical Express. As the cameras rolled, Ruddy watched as Elvis went through some moves with the Siamese dancers as all the other girls twisted in the background. Then he jumped into the middle of the Paradise Cove set and twisted “like crazy” with the Americans girls. Between takes, Ruddy noticed that Elvis relaxed but kept on eye on choreographer Charles O’Curran, as he worked with the dancers on the set. While waiting to be called back to the set, Elvis sat in a high, green-canvas chair with his name painted on the back. Flanked by two of his “pals,” Elvis sipped coffee and patted his perspiring forehead with a towel. July 7 — Producer Sam Katzman, responsible for such Elvis movies as Kissin’ Cousins and Harum Scarum, was born in 1901. He died in 1973. July 12 — Milton Berle, who featured Elvis twice on his popular network TV show in 1956, was born in 1908. He died in 2002. July 16 — Barbara Stanwyck, who appeared in Elvis’s 1964 movie Roustabout, was born in 1907. She died in 1990. July 16 — Joe Guercio, Elvis's orchestra leader in the 1970s, was born in 1927. He died on January 4, 2015, at the age of 87. July 20 — Actress Lola Albright, who appeared in Elvis’s 1962 movie Kid Galahad, was born in 1925. She died on March 23, 2017.